In imitation of the practice of his friend William Stafford, Robert Bly took to writing a poem every morning. He has explained that he stayed in bed until he finished the poem, which on some days meant getting up at dawn, on others at noon. 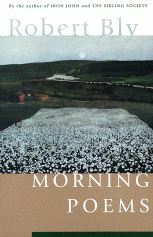 Morning Poems collects eighty or so of these "little adventures / In morning long." The adventure aspect came from Blys practice of allowing an image or memory to arise and then following wherever it led. Stafford liked Blakes image of the golden string that, if you "wind it into a ball / . . . will lead you in at heavens gate / Built in Jerusalems wall." This idea of starting with a fine and ordinary thread and drawing it into a gateway to another realm describes well the way lines move within Blys poems, delivering unexpected gifts; everyday images, descriptive and homely, move far from their source, seeming to be reinvented within the clarity of his vision: "Memories rise and fall / And leave behind a delicate openness to death." There is in many of these poems a sense of deaths presence, and a few overtly mourn the deaths of friends and family members. Bly asks, "How do we die?" and wonders "What is it like to get killed? "; and more than once he speaks of the importance of saying goodbye, "even just going to the grocery." But the Morning Poems are never gloomy, their "delicate openness" seeming to give not just lightness but light. This book offers much that is touching and wise, and these poems seem a culmination of a journey away from the cant of so many of Blys earlier poems, a journey towards humility, simplicity and ease, culminating here in verse of unusual grace and humanity. The Morning Poems are the best Robert Bly has written.